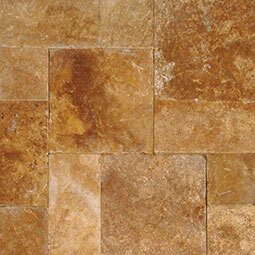 Tuscany Riviera Tumbled Travertine pavers are characterized by rich tones of gold, brown, and cream. The pavers are recommended for hardscaping projects, flooring, and walls. Available finishes include honed, tumbled and unfilled. The pavers are recommended for interior and exterior use.